Forget everything you know about Open-Arc-Weld Heads! The all new ORBIWELD TP series are completely unique in design, making it very versatile. Locating the motor inside the main housing, results in the ORBIWELD TP series being very compact in design and the revolutionary design of the drive system makes large & bulky drive mechanisms a thing of the past. These Weld Heads are supplied with an on-board compact wire feeder located close to the welding torch which ensures a responsive wire feeding which is synchronised with the puls-ing of the welding current. This gives much better control of the weld pool than systems which have to push or pull the wire from a remote, separate wire feeder over long distances, thus not allowing responsive precise synchronisation with the cur-rent pulses. For field applications the com-pact wire feeder on the weld head is more comfortable than a separate, heavy wire feeder. ORBIWELD TP heads are working with an open arc and an adjustable clamping system, which can easily adjusted to every tube size in the given range. Includes a built-in remote control for all necessary commands during opera-tion. The arc length is mechanically controlled and guarantees a constant gab of the electrode. The torch head is adjustable from 90 - 45. TIG torch and power cable from the weld head are 7,5 m long and water-cooled (extensions are possible as option) All ORBIWELD TP weld heads are supplied with hardened steel clamp jaws which provide optimal clamping efficiency. Alternatively stainless steel clamp jaws can be supplied. Optional reduction of min. clamping range down to 12 mm O.D. The P-20 weld head has been designed to enable the welding of boiler tubes fitted to tube sheets in heat exchangers. This head allows this task to be carried out using a precision Orbital Welding Power Supply, such as the ORBIMAT C range. This means that not only is the rotation of the torch is consistent and the delivery of the welding current is also kept constant and can be varied around the circumference of the tube. 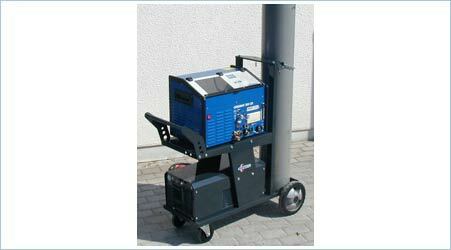 The P-20 uses a three point support system which holds the torch at a fixed distance from the weld joint. To align the tungsten to the tube a mandrel is used. This is entered in the bore of the tube to be welded. The head is supported by a chain to take the bulk of the weight if the weld head. 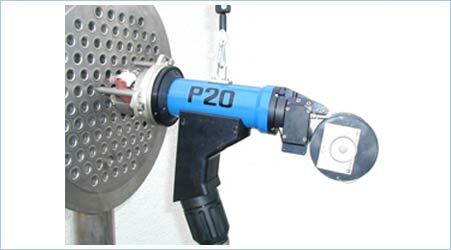 The P-20 can be used with or without a filler material. In applications which use filler material a standard´4 (1kg) reel is used and this is mounted on the head body. If welding highly reactive materials such as titanium the welding are can be covered with a purge chamber which encapsulates the welding zone. For tube inside diameters from 10mm to 26mm the welding torch can be tilted to 30 degrees to enable protruding tubes to be welded. The P-20 will also accommodate tubes from 10mm to 70mm inside diameter with the torch positioned parallel to the tube to be welded. For deeply recessed tubes and boiler tube repairs the P-20 can be fitted with an Internal Bore Welding Torch. This allows the weld to be performed deep into the tube plate or inside a vessel. The ORBIPURGE Stopper Kit contains all you need for your external purging needs. The stoppers can be used purging and blanking of tubes and fittings. Two hollow plugs of each size are supplied as well as some smaller solid plugs for blanking. 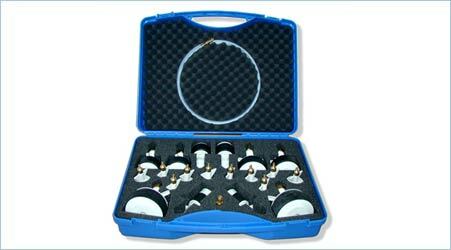 The kit is supplied in an attractive ABS case with a range of hose fittings for most applications. All plugs are made from white nylon and are lightweight and durable. The stoppers provided will cover most internal diameters between 12mm and 110mm. Larger diameters of Purge Stoppers are available individually on request. To ensure purge gas usage and times are kept to a minimum these stoppers should be used in conjunction with our ORB1001Oxygen Analyser. Quick release fittings are supplied to enable the plugs to be easily fitted to the standard ORBIMATIC Purge Hose which is supplied with our Welding Systems. The ORB1001 analyser will trace oxygen content down to 1 ppm and has the ability to be easily interfaced directly to the ORBIMAT C range of Power Supplies. We can also supply a wide range of other weld purging and monitoring equipment tailored to suit your application and budget. The stoppers provided will cover most internal diameters between 12mm and 110mm. Larger diameters of Purge Stoppers are available individually on request. To ensure purge gas usage and times are kept to a minimum these stoppers should be used in conjunction with our ORB1001Oxygen Analyser. Quick release fittings are supplied to enable the plugs to be easily fitted to the standard ORBIMATIC Purge Hose which is supplied with our Welding Systems.The ORB1001 analyser will trace oxygen content down to 1 ppm and has the ability to be easily interfaced directly to the ORBIMAT C range of Power Supplies.We can also supply a wide range of other weld purging and monitoring equipment tailored to suit your application and budget. The ORBICAR is a trolley with integrated water cooling system and gas bottle rack. It is available without cooler as well. When using the orbital welding process, the most effective way to ensure a consistent and clean internal weld profile is use a back purge with a very low oxygen concentration. 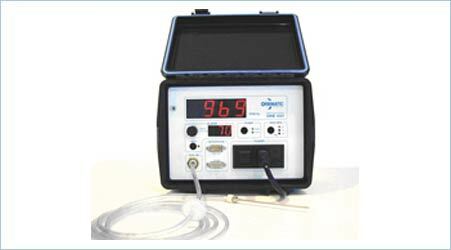 The only way to ensure that this oxygen concentration is low enough is to use an accurate measuring instrument. In the past manual welders often used formulas with time, flow rate and volume which give very rough indications and which are not precise enough for many applications. Even simple and low priced measuring units are no longer matching the requirements in Pharmaceutical, Biotechnology and Semiconductor Industry. 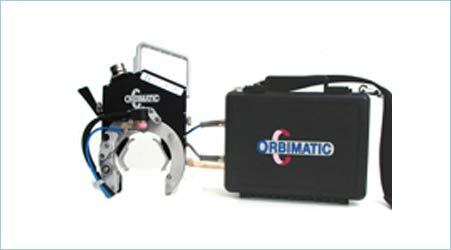 With the ORB 1001, ORBIMATIC has designed a system, which works with high precision but nevertheless is very easy in operation and very economically priced. Furthermore the ORB 1001 allows optionally interfacing with all ORBIMAT C power-sources with several possibilities of process controlling as well as PC interfacing.